Black raspberries (known to a lot of people as black caps) are less common around here, so I was happy to find a few patches of them scattered throughout our property these past weeks. They’re sweet but a little wine-y tasting, kind of brambly and complex. I picked a quart in just 10 minutes or so, ate as many as I wanted, and then picked some more, so I was on the lookout for ways to use them up. A 2002 recipe from Saveur caught my eye, because it called specifically for black raspberries (it’s surprisingly difficult to find recipes that don’t just call for any kind of raspberry interchangeably). For the most part, it’s a standard crumble coffee cake, with a layer of batter, a layer of fruit, and a crumble-like topping, but the crumble includes just a little bit of chopped semi-sweet chocolate. In the oven, chocolate and brown sugar melt into the berries, cooking down into a jammy layer that’s pretty unusual, playing up the darker character of the black raspberries. Tea-towel stains aside, I’ll be making this again with the quart of berries I have stored away in the freezer. Happy summer—here’s hoping you have a patch of something good to plunder near you. Adapted from this 2002 Saveur recipe, I found that the baking time was off–my berries expelled a ton of juice, making for a wetter cake that took a long time to cook through. The resulting cake is nice and moist and dense, but takes longer than the original recipe calls for. I’ve adjusted cooking times based on my experience, but you may want to start checking around the 40 minute mark in case I just had very juicy batch of berries. Also, they do note that you can use red raspberries—but I haven’t tried that. Make the topping: In a small bowl, mix the brown sugar and flour. Using your fingers, cut the butter into the mixture until it is evenly distributed in small pieces throughout (the mixture should look sandy). Stir in the chopped chocolate and set the mixture aside. Preheat the oven to 375 degrees Fahrenheit. Grease an 8-inch, springform pan and set aside. Whisk together flour, baking powder, baking soda, and salt in a medium mixing bowl. In another medium-sized bowl, whisk buttermilk, egg, vanilla, and melted butter. Add the wet ingredients to the dry ingredients and stir until just completely combined. Pour the batter into the prepared pan. Spread the berries evenly in a layer on top of the batter. Sprinkle the topping evently over the berries. Bake for 50-60 minutes, until cake does not jiggle in the middle when you tap the pan, and edges are dark brown. Allow to cool for at least ten minutes, then serve warm or at room temperature. Keeps for up to a week wrapped tightly in plastic. Love this! Never had these black raspberries (to my knowledge / memory). Blackberry picking later in summer on the west coast is a favorite, or wild blueberry/raspberry/strawberry picking in Canada around this time of year. But right now I’m settling for exploring the trees I have on the property we just bought. Evidently figs fruit twice, including right now, so had one of those and it was pretty divine. Pretty magical fruit trees are! And wild fruit bushes too. Oh, yes. Oh my. Black raspberries. These I have to buy, not pick, from specialty berry farms two hours away in California’s cooler regions. Thrilling that you have found them wild! Maybe I am on the wrong coast. Thank you for this! We have an abundance of black raspberries here in SE Michigan and they are so nostalgic for me. Nobody ever seems to have recipes for them, or have even heard of them, so I’m glad to see this! Thank you for this! Black raspberries were a staple of my southwestern Pennsylvania childhood and, now that I live on the west coast, they’re one of the things that I always miss most during the summer (well, in addition to humid evenings on a patio). This recipe sounds wonderful–love the whisper of chocolate amongst the jammy berries–but I also highly recommend some of your stash be used for black raspberry ice cream, which is truly one of the loveliest flavors. 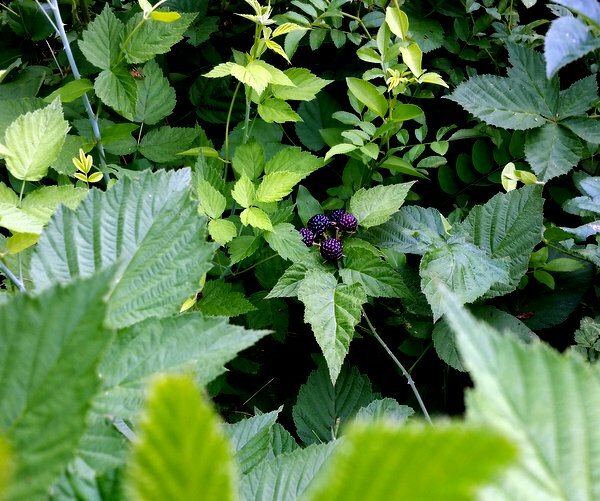 A cautionary tale: Several years ago we planted one or two tiny black raspberry plants outside the fence that borders our vegetable garden. They are so delicious, although picking is a bit hazardous between the bees and the prickers! I loved using them in pies and muffins…froze as many as I could. But then, our small plants became huge, as we were inexperienced pruners and clippers. Last year they took over three large raised beds in the garden; every tentacle drooped to the earth giving birth to a new and multi-tentacled offspring. We finally gave up trying to tame them. Needless to say, this spring several berry plants were completely dug up, others cut almost to ground level, and our plans to transplant them have been stymied again by the needs of the veggies. But oh, how lovely the taste! Yvette, your “cautionary tale” made me want to have my own private black raspberry wilderness, mabe like 1/4 acre, with accessible paths throughout. This, in addition to my day-dreams of abundant hedges of other berries—black, red, goose—and currants of all colors. When my three daughter were little, we used to go berry-picking in back of my parents’ house, on a mountainside in Vermont. Our “cautionary tale” is that we had to be on the alert for bears, waking up fom their nap in among the berry bushes, hungry for a snack. I was just- quite literally yesterday- thinking about trying to research wild blackberry patches in Salt Lake. One of the things I miss most about the place I grew up is knowing where I could consistently find berry patches in the summer… they truly are a different type of spectacular. How exciting to find a recipe for Black Raspberries. I actually grow them in my backyard here in Northern California – I had never had them before, but decided to plant them along with Ollalieberries and so enjoy them every year. It’s near the end of the season, so I don’t have enough left to try this coffeecake, but I will keep it for next year and will surely have to make it! you left out when to add sugar — do you mix with dry or wet before adding to other dry? thank you. You are currently reading Black raspberry coffee cake at The Yellow House.